During the 1990s, a social and legal expectation arose in the United States that single mothers would usually be in the workforce, even when their children were young. In turn, this immediately raised a question of how child care would be provided. The 2019 Economic Report of the President from the White House Council of Economic Advisers, offers some useful graphs and analysis of this subject. Here's are some patterns in the labor force for "prime-age" women between the ages of 25 and 54, broken down by single and married, and children or not. Back in the early 1980s, for example, single women with no children (dark blue line) were far more likely to be in the labor force than other women in this age group, and less than half of the married women with children under the age of six (green line) were in the labor force. But by about 2000, the share of single prime-age women with no children in the labor force has declined, and had roughly converged with labor force participation rates of the other groups shown--except for the labor force participation rates of married women with children under six, which rose but remained noticeably lower. The report notes: "These married mothers of young children who are out of the labor force are evenly distributed across the educational spectrum, although on average they have somewhat less education than married mothers of young children as a whole." 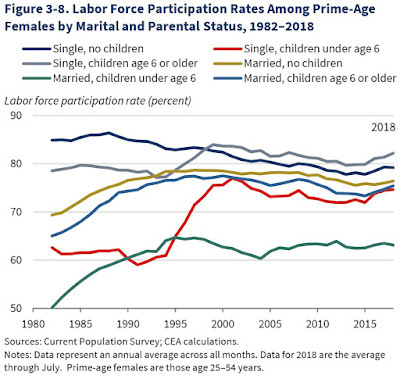 The two especially big jumps in the figure are for labor force participation of single women with children, with the red line referring to single women with children under the age of six and the gray line referring to single women with children over the age of six. 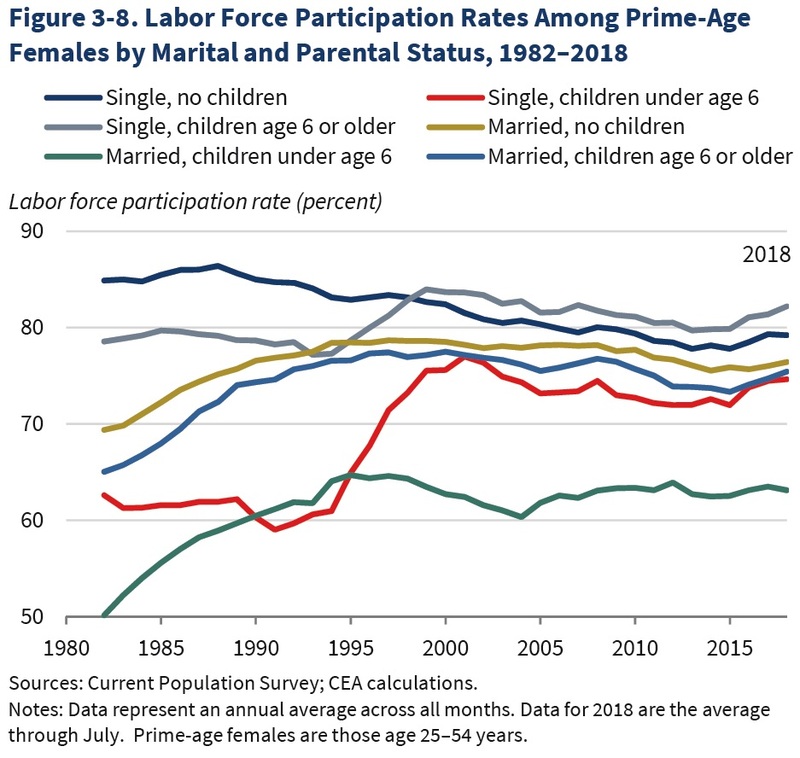 Back around 1990, single and married women with children over the age of six were in the labor force at about the same rate, and single and married women with children under the age of six were in the labor force at about the same rate. But after President Clinton signed the welfare reform legislation in 1996 (formally, the Personal Responsibility and Work Opportunity Reconciliation Act of 1996), work requirements increased for single mothers receiving government assistance. If single mothers with lower levels of incomes are expected to work--especially mothers with children of pre-school age--then child care becomes of obvious importance. But as the next figure shows, the cost of child care is often a sizeable percentage of the median hourly wage in a given state. And of course, by definition, half of those paid with an hourly wage earn less than the median. Mothers who are mainly working to cover child care costs face some obvious disincentives. The report cites various pieces of research that lower child care costs tend to increase the labor force participation of women. For example, a 2017 "review of the literature on the effects of child care costs on maternal labor supply ... concludes that a 10 percent decrease in costs increases employment among mothers by about 0.5 to 2.5 percent." So what steps might government take to make child care more accessible to households with low incomes? Logically, the two possibilities are finding ways to reduce the costs, or providing additional buying power to those households. 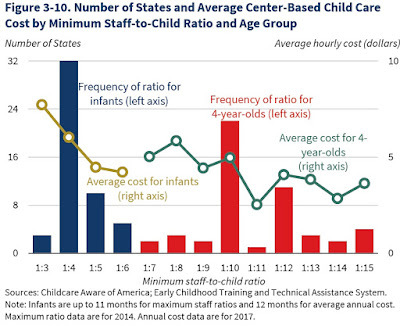 When it comes to reducing costs, one place to look is at the variation in state-level requirements for child care facilities. It's often politically easy to ramp up the strictness of such requirements; after all, passing requirements for child care facilities doesn't make the state spend any money, and who can object to keeping children safe? But when state regulations raise the costs of providing a service, the buyers of that service end up paying the higher costs. The report points out some variations across states by staffing requirements. 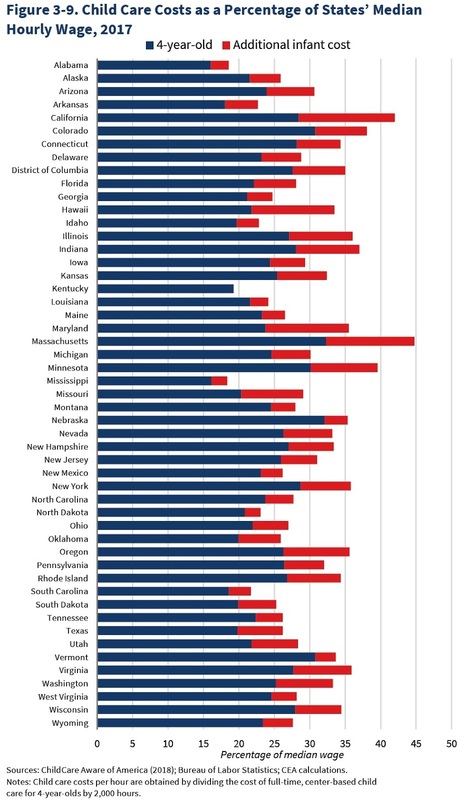 "For 11-month-old children, minimum staff-to-child ratios ranged from 1:3 in Kansas to 1:6 in Arkansas, Georgia, Louisiana, Nevada, and New Mexico in 2014. For 35-month-old children, they ranged from 1:4 in the District of Columbia to 1:12 in Louisiana. 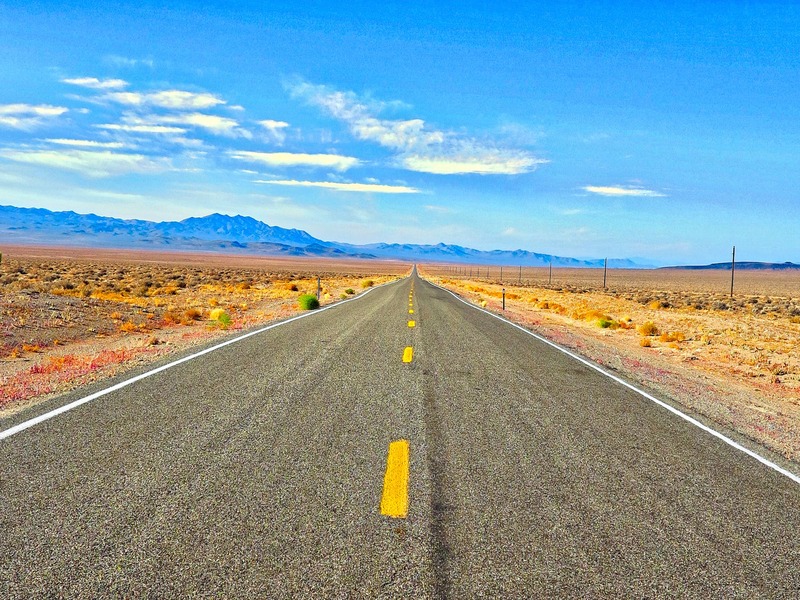 For 59-month-old children, they ranged from 1:7 in New York and North Dakota to 1:15 in Florida, Georgia, North Carolina, and Texas. Assuming an average hourly wage of $15 for staff members (inclusive of benefits and payroll taxes paid by the employer), the minimum cost for staff per child per hour would range from $2.50 in the most lenient State to $5 in the most stringent State for 11-month-old children, from $1.25 to $3.75 for 35-month old-children, and from $1.00 to $2.14 for 59 month-old children." Here's a figure illustrating the theme. 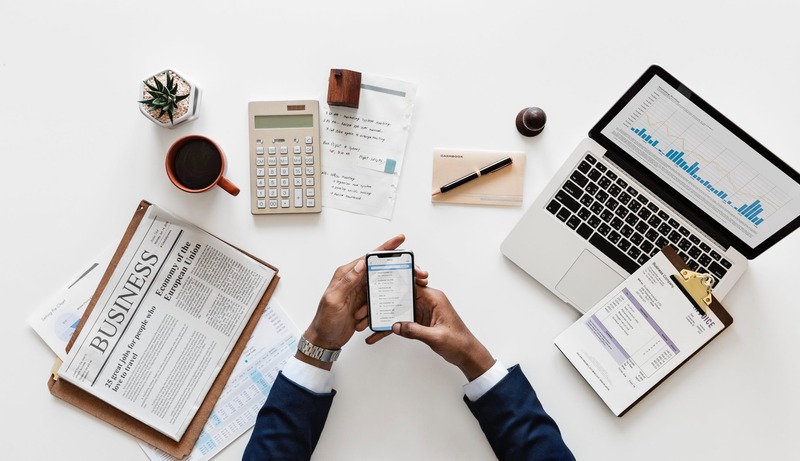 Wages are based on the local labor market demand for the employees’ skills and qualifications, as well as the availability of workers in the field. 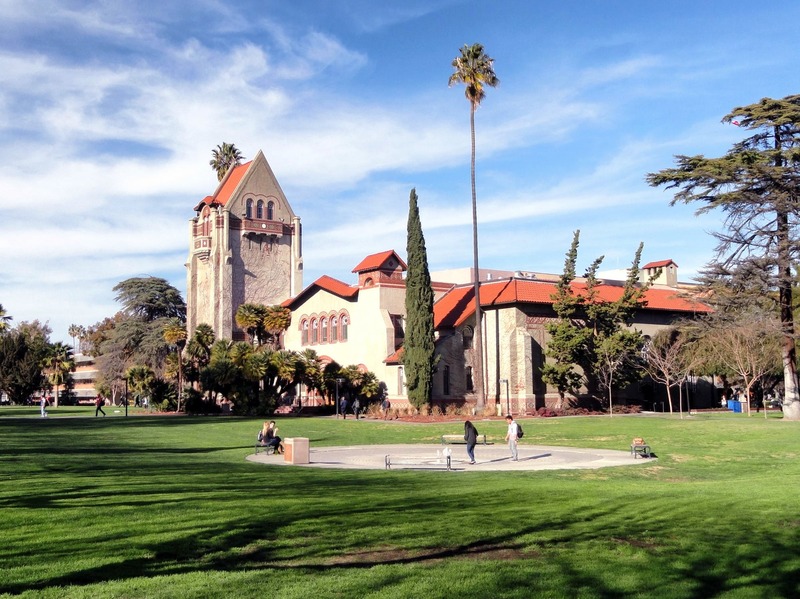 Regulations that require higher-level degrees or other qualifications drive up the wages required to hire and retain staff, increasing the cost of child care. Though recognizing that some facilities are exempt from these requirements, all States set requirements for minimum ages and qualifications of staff, including some that require a bachelor’s degree for lead child care teachers. Other staff-related regulations that can drive up costs include required background checks and training requirements. 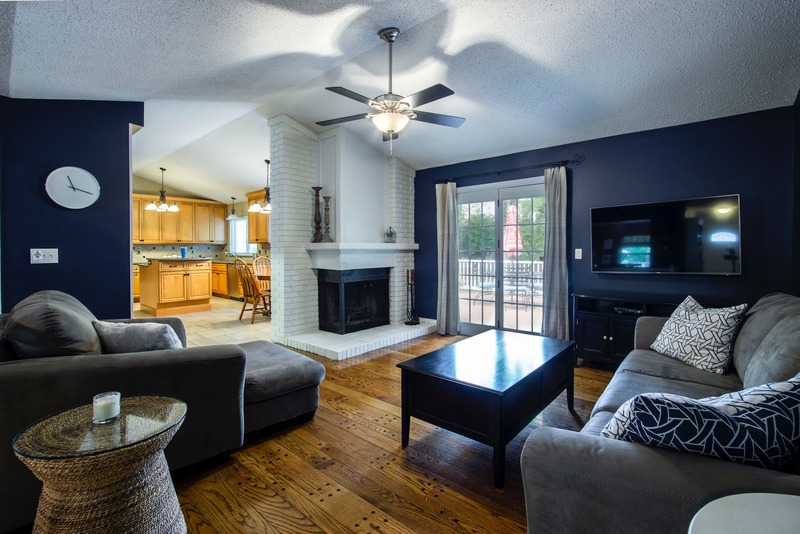 In addition to standards regarding staff, many States set minimum requirements for buildings and facilities, including regulating the types and frequency of environmental inspections and the availability of indoor and outdoor space. The report looks at some studies of the effects of these rules. One study estimates "that decreasing the maximum number of infants per staff member by one (thereby increasing the minimum staff-to-child ratio) decreases the number of center-based care establishments by about 10 percent. Also, each additional year of education required of center directors decreases the supply of care centers by about 3.5 percent." The point, of course, is not that states should all move unquestioningly to lower staffing levels. It's that states should question their rules, and look at practices elsewhere, bearing in mind that the costs of rules hit harder for those with lower incomes. The Trump Administration has mitigated these work disincentives by substantially bolstering child care programs for low-income families. In 2018, the CCDBG [Child Care and Development Block Grant] was increased by $2.4 billion, and this increase was sustained in 2019. The Child Care and Development Fund, which includes CCDBG and other funds, distributed a total of $8.1 billion to States to offer child care subsidies to low-income families who require child care in order to work, go to school, or enroll in training programs. In addition, Federal child care assistance is offered through TANF, Head Start, and other programs. There are also mentions of how programs like Supplemental Nutrition Assistance Program (SNAP, or "food stamps") and the Earned Income Tax Credit can help to make child care more affordable. The Child Tax Credit, which was increased in the 2017 tax legislation, including "the refundable component of the CTC for those with earnings but no Federal income tax liability." There's also a child and dependent care tax credit. When it comes to the incentives and opportunities for low-income women to work, child care is of course just one part of the puzzle, and often not the largest part. But it remains a real and difficult hurdle for a lot of households, especially for lower-income women. An additional issue is that some households will prefer formal child care, and thus will be benefit more from policies aimed directly at formal child care, while others will rely more informal networks of family and friends, and will benefit more from policies that increase income that be used for any purpose. Affordable daycare is crucial for working parents.